Its been 5 months since I put the golf clubs away but I always like to do a recap on how I played so I know what to work on for next year. I probably played more golf this past summer than I did in the previous 3 years combined. 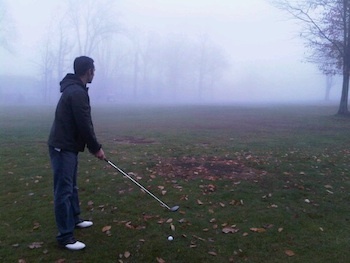 I don’t play on any golf leagues because I play softball at night but my mornings were wide open to play. With my Beachbody Coach business going very well I could move my schedule around to play. How Many Rounds Of Golf Did You Play In 2010? About 40. First round of golf was in mid April and my last one was in November. I was averaging about one round a week and sometimes two during June, July, and August because of my teacher friends looking for somebody to play with. The course I played the most was Rackham as it was closest to my house. I’ve played the other courses since High School with the exception of Boulder Pointe. Did Your Golf Scores Improve This Year? Not that much. I’m always shooting in the low to mid 40s for 9 holes and in the mid to upper 80s for 18. I did put up a 39 and finished the round with a 81(+10). Had to put together at least one good round at Rackham from playing it almost every week. Why Did Your Golf Scores Not Improve? Putting. Isn’t it the thing every golfer could work on to improve their game? That and having a “go for it attitude” instead of playing it smart. I never use to be able to hit the ball as far as I can now so sometimes I say screw it and go for it. Sometimes it works out and other times it goes into the woods. No cars, houses, or innocent bystanders were hit by one of my errant shots. Oh, and one of my jerk friends stole my 7 iron as part of a prank war that started back in college between him and I. He picked the right club to steal as the 7 iron is my money club. I use it on almost every hole for my approach shot. This forced me to hit a hard 8 or soft 6 iron into the green for my last 15 rounds of golf. Yup, he’s a jerk. Did P90X, the Insanity Workout, and Tony Horton 1 on 1 Workouts Help Your Golf Game? Yes. I was doing these workouts 5 days a week and getting much stronger in the upper body along with the core area. I probably put another 5 yards on my drive this year. That’s 35 yards gained over the past 3 years since I started doing Beachbody workouts like P90X and Insanity. I’m so much more stronger which lets me create more speed with the club head. I have the same Taylor Made Driver and Titleist DCI Irons as I’ve had for the past 3 years. My irons was where I improved the most as I don’t have to swing as hard anymore. My options are now open as I can make a couple different shots to get the ball there. The biggest gain I noticed this year in compared to last years was my strength would last for the entire round. I use to tire out a little on the back 9, but not this year. With me being as fit as I’ve ever been, my swing benefitted from it. I know your probably thinking that its golf and how can you get tired swinging a club. Practice swings, heat, and the occasional beer or two on the course adds up. Losing even 5 yards on a approach shot can be the difference of putting for birdie or ending up in the drink. I started bringing a P90X Protein Bar with me instead of eating a hot dog at the turn. Felt a little bit more energy from the protein bar. What Do You Need To Work On For Next Year? I really prefer not to hit 3 wood off the tee but I am pretty money with it and I hit it about 25 yards shorter than my driver. “Straight is great” as my dad says. Most of the golf courses I play at in South East Michigan are not that long anyways so its probably better to be in the fairway instead of launching one into the next fairway or rolling it under some trees. However, if its wide open then I’m ripping it. I’d say my golf game is about as good as its going to get right now without going to the driving range or practicing on putting greens a couple times a week. Even though I’m only a couple shots away from breaking into the high 30s it really will take a lot of extra practice to get there and I don’t see myself doing that as I prefer to play softball three nights a week during the summer. If I was on a golf league or entering tournaments then it would be different.